It's very difficult not to start by using the words "this is one piece of equipment I have been waiting to get my hands on for some time." Well, I have to admit this is true ever since I saw the first Roland Guitar Synthesizer two years ago and was knocked out by some of the sounds it produced; but then it was in expert hands. I succumbed to the temptation of whipping the thing out of its box, plugging the guitar in and trying out some sounds before I had sorted out what each control does. I suppose in a way it was very similar to my first encounter with a keyboard synth when you expect to be able to play and produce sounds like Rick Wakeman straight away. Anyway let's start at the beginning and go through this unit in the proper sequence. The synth comprises two main sections - guitar and electronics. That may sound obvious but it isn't really, as the guitar is supplied with, and is an integral part of the synth. Unfortunately it isn't possible to plug your favorite guitar into the electronics section and make this thing work. For anyone not familiar with the principles of the guitar synth I will briefly explain. A conventional keyboard synth uses in essence a single oscillator whose frequency is proportional to a DC control voltage. This control voltage is derived from a keyboard set up such that the voltage steps between keys gives the correct semitone intervals on the oscillator. The problem with the guitar is that it is not very easy to derive this control voltage. Several methods have been tried with varying degrees of success, but Roland perhaps have been the most ambitious in using what really is the best way of controlling the VCO. This involves a circuit which senses the frequency of the note being played, converts it to a control voltage which is then fed to the voltage controlled oscillator. This means that the oscillator can precisely follow the string frequency where required. Other problems associated with this string sensing will be looked at a little further on. The synth is polyphonic, that is each string has its own sensing circuit coupled to its own voltage controlled oscillator. This enables multiple notes or chords to be played without any problems. Now you probably see why a standard guitar can't be used, as each string has to have its own separate pick-up. Anyway, several of the useful controls for the electronic part of the synth are removed onto the body of the guitar to allow quick and easy adjustment. So firstly let's take a look at the guitar itself. The first big question is of course, is it any good? In fact it is. It does look conventional, in a way a little reminiscent of a Gibson SG only a little larger and in a rather nice walnut type finish. Not wishing to spend too long describing the guitar, suffice to say that all the guitarists who tried it were pleasantly surprised – a very nice neck with low action and no fret problems and nicely balanced body, saw to that. The only odd criticism was regarding the slightly heavy gauge strings fitted - however this I think is deliberate to try and avoid false triggering of the VCO's. Two normal pick-ups are fitted to the guitar to enable it to be used as a normal guitar the only signs that this is a far from standard guitar are the extra controls and switches — a specially wound pick-up (for the sensor circuits) and a multiway socket for connecting this guitar to the electronics. Controls provided on the guitar are: firstly, as you would expect a straight pick-up selector switch (for the normal guitar sound), volume and tone controls. A rotary balance control is provided for the selecting, or mixing the guitar and synth sounds. Two controls from the voltage controlled filter (cut-off frequency and resonance) also find their way onto the guitar, together with a selector switch for determining whether the VCO's or the distorted guitar sound go through the waveform shaper. I had better explain the distortion sound here. As separate pick-ups are provided for each string, Roland have also provided six separate distortion circuits for these six strings. This allows for a unique kind of distortion; it means that one or more strings can be played with nice smooth distortion without intermodulation effects. On its own this is a rather nice sound especially on chords — mind you it is overshadowed a little by the sounds the synth itself can provide. Anyway this "distorted" output can, as I say, be selected to pass through the waveform shapers either on its own or additionally with the output from the VCO's (or of course VCO's on their own). One more rotary control is provided, this being LFO (low frequency oscillator) depth for the VCO vibrato - although the frequency of this LFO is adjustable on the main unit. Now one more thing I do like is the system by which this LFO is switched in and out. Two touch plates are provided either side of the bridge pickup. One of these when touched, switches the LFO in - the other when touched and released switches it out again Additionally this second touch plate switches the LFO in for as long as it is touched - hope you understood that OK.
A multiway socket for connection to the main electronics and a standard jack for normal guitar operation are provided on the side of the guitar. So now for the main unit. This looks rather smart in deep blue and is built to stand on the floor with five touch-foot switches arranged along the front of the unit. What is rather nice is that above each switch is an LED for 'on' indication, and when off, each LED flashes at reduced power. This is so that the position and setting of the foot switches can be quickly seen even in the dark. Firstly on the unprocessed side the output from the six strings appear on six LED's across the top of the unit. Below each LED is an on/off slider switch for selecting which strings are fed through to the synth section. This in conjunction with the guitar/ synth control allows you to play normal and synth at the same time. Next to these switches is another slider for switching compression in and out. Actually this is a very useful facility for production of certain effects. Again a little explanation here is in order. Unlike a keyboard synth it is difficult sometimes setting up exactly repeatable effects because it appears that the amplitude of the signal from the guitar also acts as a control signal for the envelope modulator. Trying to put it simply — when a string is plucked and triggers an oscillator, the oscillator sound dies away at a rate seemingly determined by the rate at which the original string dies away. Switching of the compression circuit produces a constant output which dies away after a longer period. Coming to the voltage controlled filter (VCF) next, two controls are provided on the front panel: sensitivity and attack time (remember that cut-off frequency and resonance controls are on the guitar itself). LFO frequency is adjustable on the front panel for providing vibrato to the oscillators. There are then a total of five variable controls for pitch adjustment so I think it worth spending a short time explaining these. First of all an overall master tuning control is provided which shifts the VCO's up and down by quite a few semitones. In addition to this master tuning control two controls marked 'A' pitch and 'B' pitch provide well over two octaves range (i.e. they will transpose up or down by a whole octave). Each of these controls is switched in or out by its own footswitch control. Now in addition to just transposing, the rate at which the pitch is changed can also be varied. Normally this pitch change occurs instantly as each button is depressed, however two additional controls are provided – one for altering rise time, one for fall time. This means that with the rise time set at max, and fall time at min, for instance any upward change in pitch occurs slowly while downward changes in pitch occur instantly. Lastly the five footswitches along the front of the unit control the main functions, these are: pitch A, pitch B, envelope mod. invert and duet. The duet switch is an interesting one as it adds the fundamental guitar frequencies to the VCO's and when used in conjunction with pitch change (say octave above) can give some very nice 12 string type sounds. Incidentally with duet depressed and normal pitch, chorus effects are generated. And lastly (yet again) the footswitches for A and B can be set to either latching or non-latching (in the non-latching mode the pitch change only occurs with the footswitch depressed). That seems to be about it in the way of main facilities. I could now spend about three times as long (at least) explaining and describing the different sounds this synth can produce. That I would do without boring you with words like fantastic, 'amazing, unbelievable' etc. I did say earlier that one of the problems with frequency sensing is that of false triggering of the oscillators. I think Roland have set this unit up pretty well perfectly. I tried producing string noise by rubbing my hand up and down the strings but was unable to produce any nasty spurious noises. However it does mean that the output from each string must exceed a certain threshold before triggering its own oscillator. I don't think though that this is really a problem when used normally. The number of controls and adjustments associated with the envelope modulator are limited in order to keep the operational complexity of this synth to a minimum. Although one or two types of sound familiar to keyboard synth players are difficult to produce, the range of controls have been chosen very well. Many of the brass type sounds were amazing (sorry, used that word), especially when several notes were played at one time. What was quite extraordinary was the way the VCO's would follow the string frequency spot on so that even the vibrato effects produced on the strings themselves came out beautifully. Mind you with the touch switches on the guitar for switching VCO vibrato on and off some quite stunning vibrato effects were achieved. I liked the effect produced by the six distortion circuits which (when not used through the synth) gave some lovely sustain and yet produced some "clean distorted chords, if you know what I mean. Roland have done their very best to make it easy for the average guitarist to acquaint himself with all the facilities of the synth by producing a very detailed handbook (even if some of the spellings are a bit suspect) and a whole load of 'Sample Sounds" as Roland call them for setting up particular types of sound. Certainly the controls remoted onto the guitar itself, proved to be the most useful controls, especially the guitar/ synth balance control. One thing is for sure it took me a lot longer to really get into this synth than I anticipated and although detailed "Sample Sounds" and instructions are provided this synth has got to be aimed at the serious professional guitarist. I am pretty sure that he is probably the only person who could afford it. The main reaction from the guitarists who used this synth was one of amazement. Most just were not able to spend as much time with the unit as they wanted. 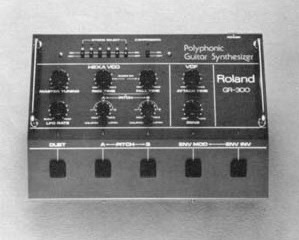 What astounds me is that as a second shot at producing one of the first guitar synths, Roland have got it almost 100% right. Many of the minor irritations that are usually present on innovative equipment (take the early keyboard synths for instance) are just not there. I reckon it will probably be sometime before anyone is really able to master this instrument and I am pretty sure that it will still hold its own against the many other rivals that are bound to come.